When you know the story of your song, the emotional journey in your song, and why your audience wants to hear you… you can play to these strengths and write and perform better songs…. I replied with some advice, but the question kept irritating me (in a good way)… and I kept thinking about it…. How do you edit a song that you’ve “finished”? It’s a tough one to tackle without hearing a specific song, so I turned the problem around. How do you minimize the editing you song needs? I’m taking this on by checking the big picture first. This is how I deal with it… I ask and answer this question early in the songwriting process, usually before the first song section is finished. What’s the point of the song? WIIFM (What’s In It For Me?) Why should your audience listen to the song? I will explain each question in more detail and use two of my songs, Emoji Girl and Exotic Bean, as musical examples. Click here to get Daily Songwriting! Humans are captivated by stories. We love to organize events into beginning, middle and end. Stories have been around as long as humans gathered together, since fire was invented if not before…. We tell stories to make sense of the world, through myths. We tell stories to our friends and family about our day and our lives. We tell stories to ourselves to explain why we do what we do and why we don’t do what we avoid. What’s the story in your song? What happens in your song? It doesn’t need to be a narrative story song to have a story. There are two stories for any song… the story in the song, the one you’re telling while you write or sing it. The other story is about the song, the inspiration for it, where it came from, the story of how and why the song was written. A popular song is usually four minutes or less. There isn’t time to wander around or get distracted. There’s time for one story and it has to be short and succinct. If you know what the story is, you can write it more effectively. Anything, lyric or music, that doesn’t support the story should be cut (save those brilliant lines and rhymes for another song). I usually outline the story in the song before I have the first section finished. I choose a big idea or title hook, which implies a story and figure out what I want to say and how I intend to tell it. I didn’t know I was addicted to premium coffee until I was on vacation and couldn’t find a decent cup for three days. I felt mean without caffeine and couldn’t shake a headache… this is what happened to me. My wife and I visited a very nice town (that will remain nameless) for the first time. It took us than three days to find a decent cup of coffee. I didn’t think of myself as a coffee snob until I started feeling hungover and irritable. It didn’t matter what I tried, I couldn’t find coffee that satisfied…. The singer is attracted to a woman who more interested in her phone and her social media than in real people. I imagined myself trying to create a relationship with someone more interested in her phone than other people. A woman that talks in emojis. Instead of preaching about this issue, I wrote this social commentary from inside the situation. It started when two striking examples of cell phone addiction caught my attention on the same day. The first was a teenager walking across a busy intersection while gazing into his phone, obvious to the traffic around him. The second was a middle aged couple sitting in a restaurant staring at their phones while ignoring each other. I started writing as I considered their (and my own) addiction to technology and how distracted people are from each other. How likes and social media shares are important indicators of success. Your number of followers is more important than real life friends…. You can do this with a “finished” song or better yet, one that you are working on right now. Explain the story in the song… 3 sentences maximum. Explain the story behind the song… 1 minute of talking maximum. I know many songwriters who say a song needs to be able to stand on its own. But I believe that if you prime your audience and give them a framework for the song, a way to understand it… before the even hear it, your audience will pay more attention, remember it better and better understand your message. Tell the story of the song, or the story about your song before you perform it. What can you cut or change to improve the story? What would make the story even more interesting? 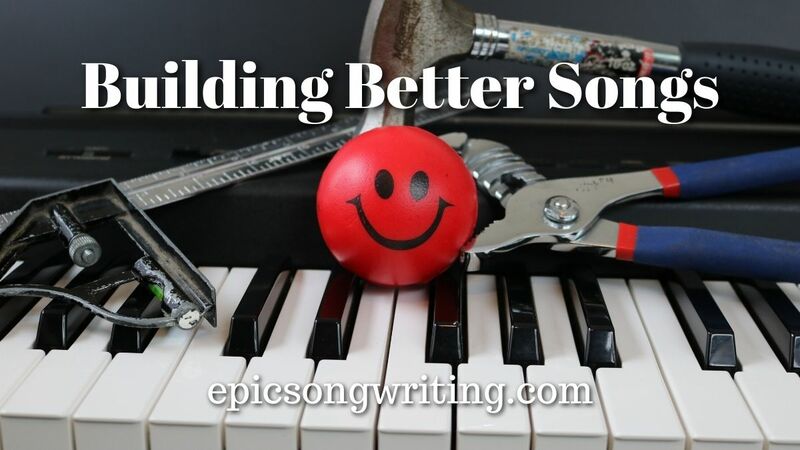 Build a better song with a stronger story in the song! Build a better rapport with your audience by telling the story of the song! Any successful song, taps into your emotional state and changes it. The best songs go further and create an emotional journey… there is a progression through more than one emotional state as the song unfolds. How do the emotions of your characters, and your audience, change during your song? Don’t write about one emotion, but the interplay of two or more. Write an emotional story with a journey. The journey is about the physical and emotional distress due to quality coffee withdrawal. Nobody likes to experience discomfort so I balanced it with humor and strong chorus hooks to make it feel good for the listener. The emotional journey follows a relationship from the “singer’s” initial attraction to a woman in the first verse, through their shallow communication in the pre-chorus. In the chorus, he sings of loving an Emoji Girl who is lost in her emoji world. In the second verse he realizes that the relationship isn’t working, and in the bridge he decides that he needs to break up with her. Explain the emotional journey in your song… one paragraph maximum. What are the emotions that you tap into… what do you want your audience to feel? How can you heighten the emotional content in your lyrics? How can you better support the emotions of the lyrics with your music? Build a better song with a more dramatic emotional journey! What’s in it for your listener? Why should they listen to you or your song? It’s what they ask again any time their attention wanders during your song or your set. Take control with a live introduction from the stage or in the text before your video in a social media post (see What’s the story? above). But the listener needs an ongoing answer throughout the song… why should they keep listening? If you have a goal in mind as you write, this will often take care of itself. Do you want them to hear a message? Dance like there’s no tomorrow? how you can be uncomfortable when you’re out of your usual routine. The solution in the bridge is plan ahead and take your creature comforts with you if you don’t want to miss out on other good things. I want my audience to hear the message that human interaction is more important than pixels on a screen. It also reminds me to turn off my own phone…. Think about you own listening habits… they will be different than those of non-musicians, but stay open to insights. Remember that your audience doesn’t care about your song the way you do. You created it for them… figure out what are they getting from it, don’t just guess. Talk to people… especially your friends and fans. Talk to them live, in person, not just through the internet! Be able to explain your song before you finish it. Don’t assume that it will be instantly understood by everyone. Build better songs by understanding your audience! Know the big idea and the message of your song is before you are deep into the songwriting process. How do emotions you evoke change during the song? When you know why are they listening to you… you can do more of it! Every line and lyric should support the message you want to share… if a lyric doesn’t help tell the story, change it or cut it! Most importantly: plan your songs so you don’t have to fix them when you’re finished! How to Avoid Lyric Fail, when you’re not sure which lyrics to change or what to change them to…. How do you fix your songs before you finish them? 0 responses on "Building Better Songs"